Can You Bring Gold into the U.S. Without Paying Duty or Taxes? Great Britain’s recent vote to withdraw from the European Union has raised a lot of concerns for people who trade in gold and other precious metals. For as long as Britain was a member of the E.U., it was possible to move gold between Britain and other E.U. countries without paying duties. But now, some kind of tariffs and duties are probably on the way. What effects will those tariffs have on the trading price of gold internationally, or on how desirable an investment gold becomes? Another Question: What If You Want to Bring Gold in or out of the United States Today? 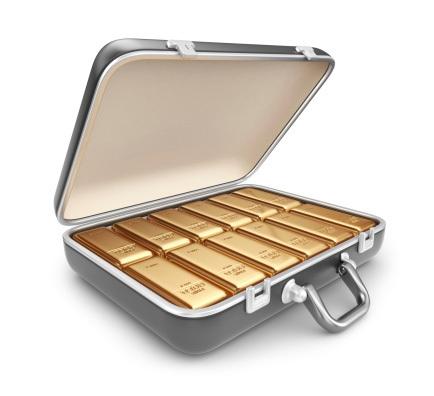 Before you bring your briefcase full of gold bullion bars into the country, you may want to read this post. Credit: Alexander Bedrin/iStock. Do you have to pay duties on gold that you bring into the U.S. today? Today’s blog post offers only general information on financial matters, and is not meant to replace the advice of a qualified financial consultant or accountant. But with that statement aside, here is some general information you should know. There is no duty to be paid when bringing investment-grade gold bullion or coins into the U.S. Different laws may apply when bringing foreign currency into the U.S.
No matter what you do – or intend to do – your best protection is to declare everything you intend to bring into the U.S.
You cannot bring in currency or bullion, and many other items, that were made in Cuba, Iran, or Sudan. This restriction applies to items that originated in those areas; if you buy an Iranian-made gold coin in Paris and try to bring it into the U.S., for example, you can’t. Different restrictions and duties can apply to gold items with high value as collectables or fine art. If you arrive at the U.S. border with a rare piece of jewelry made by a Renaissance Italian goldsmith that you bought for $1 million in Italy, for example, you can’t try to say that it is worth only $3,000 because it only contains about three ounces of gold. You’re smarter than that, and more honest, right? You’re going to have to speak with an appraiser and an attorney before bringing your item into the U.S. But in the past, people have tried some bizarre things in order to avoid duties. And how do you handle foreign gold that needs to be recycled? If you have questions like those, you will still need expert advice from your attorney and tax preparer. But we will be glad to offer some advice, based on our past experience. Give us a call at 800-426-2344 and tell us what is on your mind. Do You Have to Pay Income Tax when You Find Gold?